Holtop has manufactured heat and energy recovery ventilation products for over 12 years. We pay high attentions on the energy saving in the modern buildings and indoor air quality, aiming at reducing carbon emission and improving human health. 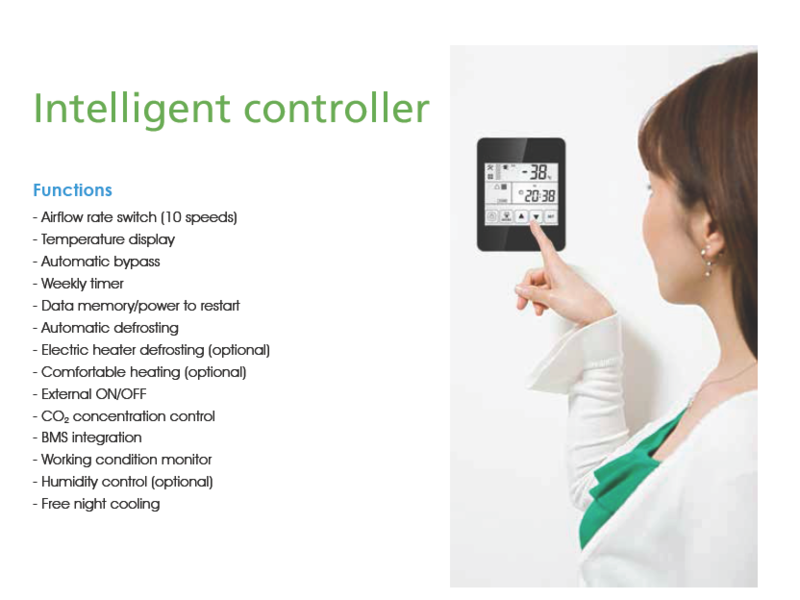 “Eco-Smart” is a new ERV series to bring down energy consumption by using DC motors and improving energy efficiency with smart control system, bringing you eco friendly climatic experience. 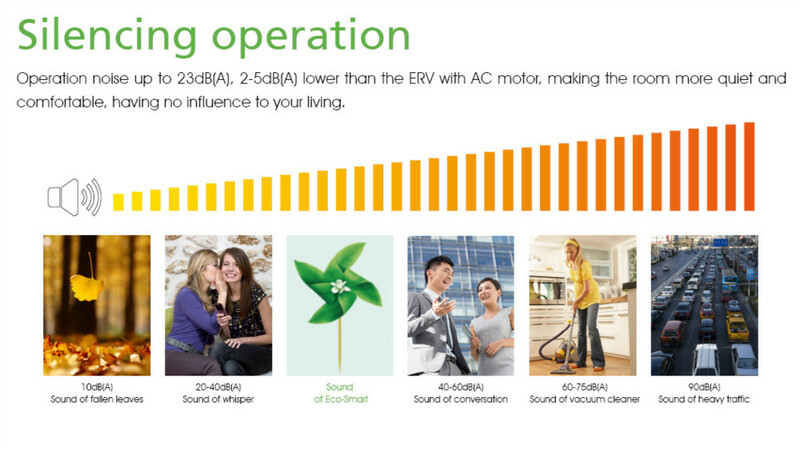 Operation noise up to 23dB(A), 2-5dB(A) lower than the ERV with AC motor, making the room more quiet and comfortable, having no influence to your living. Holtop energy recovery ventilator TP series is equipped with high efficiency counter flow plate total heat exchanger. It is made of ER paper which is featured by high moisture permeability, good air tightness, excellent tear resistance, and aging resistance. The clearance between the fibers is very small, so only the moisture molecules of small diameter can go through, the odor molecules of larger diameter are unable to pass through it. By this means, the temperature and humidity can be recovered smoothly, and prevent the pollutants infiltrating to the fresh air. Holtop heat & energy recovery ventilator can expel the stale air indoor out of room, meanwhile supplying the fresh air outside into the room, by using the advanced heat/energy recovering technology, the energy can exchange taking advantage of the difference of the temperature and humidity between indoor and outdoor air. By this means, it can not only smooth away the problem of indoor pollution, but also saving energy. Holtop products stand for TOP quality in heat recovery ventilation filed in China, certificated by CE, Eurovent, ISO and other different approved tests like anti-flaming test, anti-mold test, energy saving product test. Etc. 1.We help to select models based on your requirements. 2.We provide professional product schemes and technical reports. 3.We design and develop the new products according to your requirements. 4. We provide professional advice for your installation, debugging and operation. 5. We supply the spare parts and technical support in & after the warranty time. 6. General testing and operational test carried out for every units before delivery. 7. We supply the training service at our factory if you need. 1. Technical advice for commissioning, installation, operation and maintenance. 2. Free spare parts for replacement during warranty period. 3. Or 1% free spare parts as warranty for container delivery. 1. How to select the suitable models? Based on the fresh airflow you need. Please send us the room area, room type or application and number of persons, our team will help you select the suitable units. 2. What’s the difference between Miss Slim series, TH series and TP series? Miss Slim series is specially design for the residential houses which required slim size for installation, the airflow rate for Miss Slim series is from 100-350cmh. The access door position and configurations are different with TH series and TP series. TH series is equipped with crossflow heat exchangers, the airflow ranges from 150-1300cmh, with features of silent operation and cost effective. TP series is equipped with cross counterflow heat exchangers with higher heat exchange efficient. 3. Why choose Holtop as business partner? Holtop is the leading manufacturer in China specializing in the production of air to air heat recovery equipments for more than 10 years. 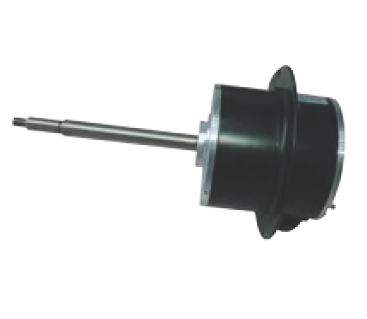 Holtop can supply a full range of products, up to 20 series and 200 specifications. The product range mainly covers heat and energy recovery ventilators, rotary heat exchangers, plate heat exchangers and air handling units. Holtop has 400 employees and covers an area of more than 30,000 square meters. Annual production ability of heat recovery equipment reaches 100,000 sets. Holtop supplies OEM products for Midea, LG, Hitachi, McQuay, York, Trane and Carrier. As an honor, Holtop was the qualified supplier for Beijing Olympics 2008 and Shanghai World Exposition 2010. 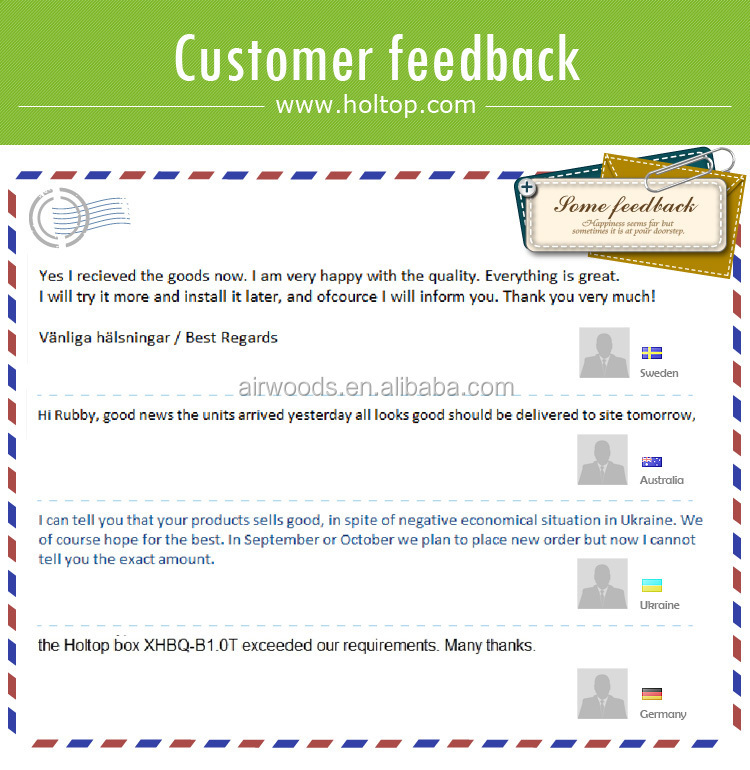 Holtop has established business relationships with major countries in Asia, Europe and North America, and earned a worldwide reputation for providing reliable products, knowledgeable application expertise and responsive support and services. 4. How about the product quality? Holtop assures high quality products with professional R&D team, first-class production facilities and advanced management system. Holtop owns numeral control machines, national approved labs, and has successfully passed the certifications of ISO9001, ISO14001, OHSAS18001, CE and EUROVENT. All our products are tested 100% before ex-factory to ensure high quality.